Use this screen to enter all vendor payments. Whenever you are making any payments to your vendor, please record that transaction on this screen. 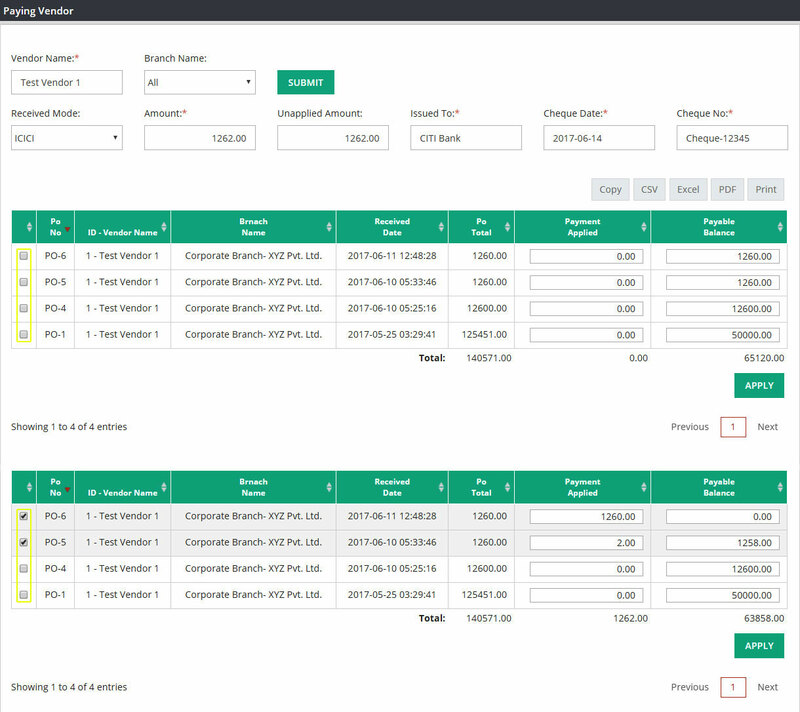 This is important to keep a track of all the payments which you making towards purchase orders. You can record all cash and check payments on n this screen. Vendor Name : Please enter the vendor name whom you are paying. Branch Name : Please enter the payment branch name from where you are making this payment. If you are a single branch company, company name will appear here by default. Payment Mode : Please select the payment mode. It will either cash or any of your bank account. Amount : Please enter the total amount which you are paying to vendor. Unapplied Amount : Unapplied amount filed should always display zero balance. If not then there is a difference amount between payment amount entered in amount filed and PO total which will be reconciled here. If you select payment mode as any bank then 3 more fields will appear here. Issued To : Please enter the bank name when you are issuing the check directly to vendor’s bank. Check Date : Please enter the date which is mentioned on the check. Check No. : Please type the check number here. After entering all the details on above fields, please click on the check box against Purchase order number and then click on apply. Once you click on Apply, Purchase order or multiple purchase orders which you have tagged with the payment will disappear from this screen. 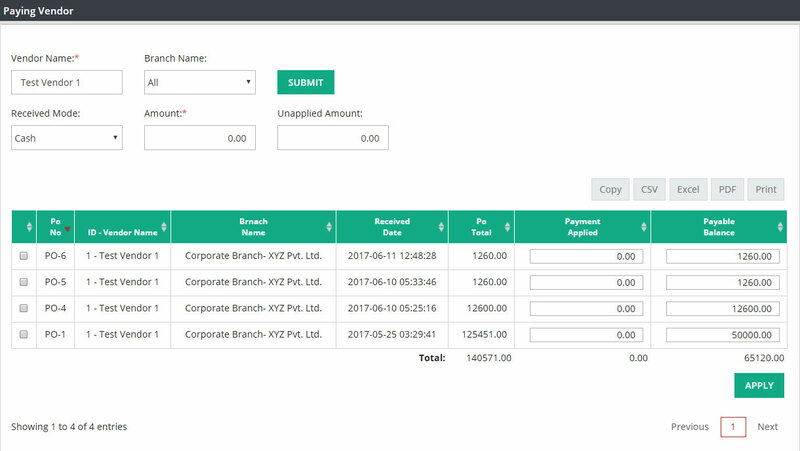 System will generate one vendor payment receipt as a record of your payment and you will be able to view that receipt in Vendor Payment Receipt screen.